MILFORD, Indiana, USA - Chore-Time's Modular Manure Belt Cage System offers egg producers the outstanding production performance they expect from Chore-Time, plus greater shipping simplicity, easier assembly and repair, and improved egg roll-out - all in an economical cage system designed for long years of dependable service. The result: a quality environment for birds and peace of mind for egg producers. The individual cages measure 24 inches wide by 22.34 inches deep by 18 inches tall (610 x 567 x 457 mm). The manure belt cage system is available in 3-high to 8-high models with cage rows up to 520 feet (160 meters) long. For this modular cage system, Chore-Time developed a full-front horizontal cage door to give birds easier, more comfortable access to feed. The door design also aids producer access to the cage's interior. The cage system offers enhanced egg handling and roll-out with a dual slope floor and an increase in distance from cage to egg tray to help protect eggs from bird damage. Made in the U.S.A., this Chore-Time manure belt cage model's unique modular design makes the system easier to ship, assemble and maintain. Cages include individual floors rather than typical eight-foot (2.4-meter) floor sections, making it easier to replace a damaged cage or to remove a cage floor for access to the manure belt. 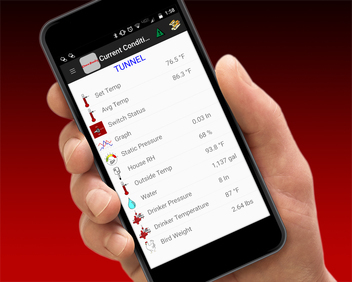 This Chore-Time System is also available with an optional air tube that is one of the industry's largest. The air tube option comes with integrated drinker catch tray and large air openings to increase the air volume over the belt for better manure drying. 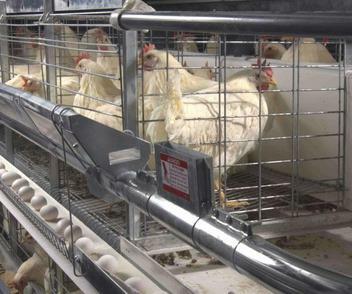 Chore-Time's Modular Manure Belt Cage System is another part of the company's complete egg production package including cages, feeders, drinkers, egg collectors, feed conveying, feed storage, controls, and manure handling.